Motorola offers two way radio walkie talkies that can withstand any environment and even offer radios that are specifically made for industrial and construction. 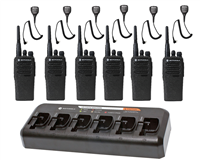 Keep your employees safe by utilizing two way radios to request help quickly and know that no man is alone. Move and organize inventory quickly and request assistance with enhanced communication. Even if you are operating heavy machinery and are surrounded by noise, earpieces and other audio accessories give you the ability to send messages clearly and insure that your message is heard. Motorola offers two way radios that can withstand drops on concrete, the harshest of weather, and long work days. Find which radio is right for you below and see the results for yourself!